Although the Kingston Frontenacs surprised most and bowed out of the first round of the OHL playoffs, most would seem to call it a day on this year’s hockey season. However, for a select couple of Fronts, they now turn their attention to the National Hockey League Entry Draft taking place at the Wells Fargo Center in Philadelphia, Pennsylvania. This is a monumental time in a junior, heck, every hockey player’s career. It can justify all the decisions that were made soundly or made in haste. 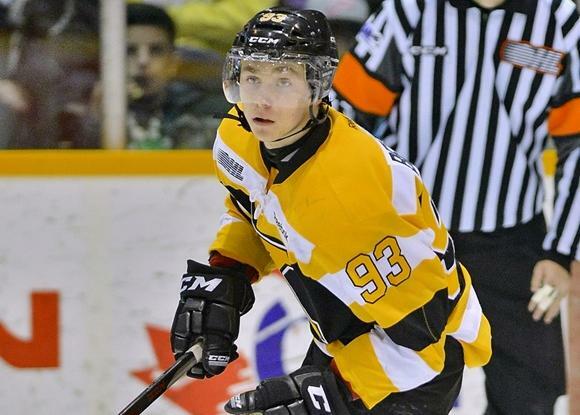 Three players on the Frontenacs squad are looking at being taken by teams in the first round. Roland McKeown, Spencer Watson and superstar Sam Bennett who seems to be in the race to be taken first overall. A native of Richmond Hill, Ontario, Bennett has been with the Frontenacs for two seasons. His resume for the past year is an impressive one. He won double gold last summer for Team Canada at both the World U18 Championship and the 2013 Ivan Hlinka Memorial Tournament over in the Czech Republic. Returning in the fall on a high for the Frontenacs, Bennett managed to put together an impressive 24 game scoring streak before a minor injury put him out of commission for a few games. The NHL Central Scouting Bureau ranked Bennett as the top North American player to be drafted in their mid-season ranking. I’m sure that rank hasn’t changed much. Bennett managed to become almost a two point a game player. His final point total for the 2013-2014 season saw him notch 91 points in 57 games. Pretty impressive for a lad who suffered a mid season injury. He was an essential asset to Kingston as well in their limited playoff run. In 7 games against the Peterborough Petes, Bennett notched 5 goals and 4 assists. There’s no doubt the Sam Bennett will be drafted into the National Hockey League this summer. The question now turns to what rank and to what team. He would be an essential asset to a club like the Buffalo Sabres or the already youngster filled Edmonton Oilers. We won’t find out where the teams fall for a few more weeks.